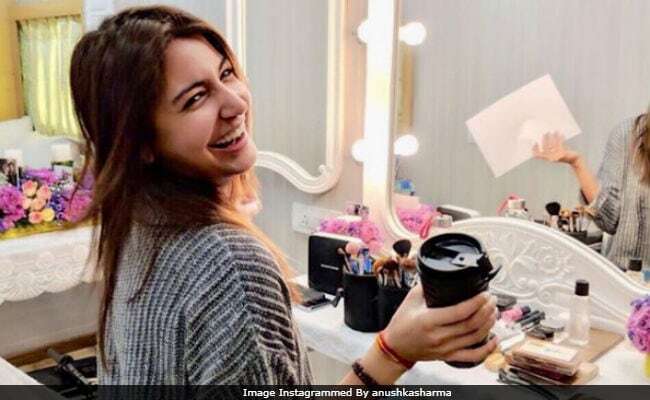 Actress Anushka Sharma, who returned to Mumbai on Sunday, is back at work. She posted a picture from the vanity van and captioned it as, "They say - Back to one! In this case I'll say - Back to Zero. Happy to be back on the film and back to work with my lovely co actors and crew. Thank you for the beautifully decorated floral van." Anushka will now start filming Zero, her next film with Shah Rukh Khan and Katrina Kaif (also her Jab Tak Hai Jaan co-stars). Anushka touched down in Mumbai from South Africa on Sunday afternoon. She was accompanying her husband Virat Kohli, who is currently playing a test series against South Africa. Anushka posted this picture today. Shah Rukh and Katrina started filming Zero a couple of months ago and Anushka was expected to join the cast later. She married cricketer Virat Kohli on December 11 in Italy and the duo went to Europe soon after the wedding. Later, they hosted two wedding receptions - in Delhi and Mumbai - respectively. Anushka then flew to South Africa with Virat and the rest of the Indian cricket team. They spent the New Year in Cape Town and shared a couple of pictures from there. Anushka Sharma and Virat Kohli, both 29, married in an extremely private ceremony at a Tuscan resort. The festivities also included a ring ceremony followed by mehendi. Meanwhile, post-marriage, Anushka will be next seen in Pari, which is slated to release this February. She also has YRF's Sui Dhaaga with Varun Dhawan in the pipeline. Zero, directed by Aanand L Rai, releases later this year.